White House Pushes New Truck Safety Regulation While Loosening Obama-Era Rules Truckers complain they work in one of the nation's most overregulated industries. Advocates worry rolling back safety regulations will make highways more dangerous. 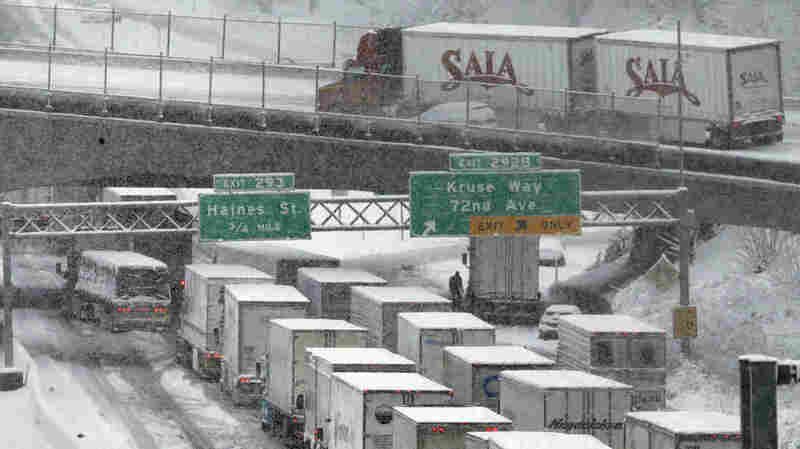 Early-morning traffic backs up on Interstate 5 during a Jan. 11 snowstorm in Portland, Ore. Truck drivers say such conditions, combined with limitations on their working hours, cost them a lot of money because of their mileage-based pay. Some of the nation's 3.5 million truck drivers staged protests with their big rigs at truck stops and a few state capitols around the country on Monday, in hopes of derailing a new safety regulation that is set to take effect later this month. The truckers are hoping the Trump administration delays the Dec. 18 implementation of the federal mandate requiring commercial trucks to be equipped with electronic logging devices, or ELDs, which will monitor the time drivers spend on the road to help ensure that they don't go over the maximum number of hours they're allowed to drive. ELDs will replace old paper logbooks drivers used to track their hours, a system first developed during the Franklin D. Roosevelt administration in the 1930s. The documents sometimes are called "comic books" because they're so easily fudged, and regulators and safety advocates say truckers point to examples of other truckers falsifying logbooks, leading to deadly fatigue-related crashes, as the reason ELDs are needed. But many truck drivers say the electronic logging devices are expensive and don't provide flexibility in dealing with the realities of life on the road. And if recent actions are any guide, the truckers have good reason to hope the ELD mandate will be stalled, because the Trump administration has already hit the brakes on a range of Obama-era trucking safety regulations. Truckers complain they work in one of the nation's most overregulated industries. "Federal regulators simply don't have a clue," says Todd Spencer, executive vice president of the Owner Operator Independent Drivers Association, a trade group. "They don't have a clue what truckers do, how they go about doing it, the environment that they live in, the schedules and things like that, the demands of the job." Take the federal hours-of-service rule, for example, which limits truckers to driving for 11 hours per day within a 14-hour period, followed by 10 hours of rest. It's what the electronic logging devices are designed to enforce. "Once your workday starts, then 14 hours later, it has to end," Spencer says. "It doesn't take into account delays that you may encounter at a shipper or receiver, or as a result of construction or congestion, or maybe a crash on the road." Such delays can waste several hours while a driver is on the clock — and that's a huge problem for truckers because most are paid not by the hour but by the mile. So while most truck drivers are working around the schedules of everyone else, "the regulations sort of fly in the face of that," says Spencer. "It's just nuttiness." Many midsize and bigger trucking companies are on board and already use ELDs across their fleets, but many independent drivers and owner-operators balk at the mandate, citing the cost of the devices — the most popular of which run nearly $500. They're asking the Trump administration for a delay and for exemptions for drivers with clean safety records. Safety advocates say there is good reason for the ELD mandate: Fatigue is a common factor in truck-related crashes. "We see these issues in crash after crash, and we're tired, yes we are tired, of seeing commercial drivers being tired," said Robert Sumwalt, chairman of the National Transportation Safety Board. 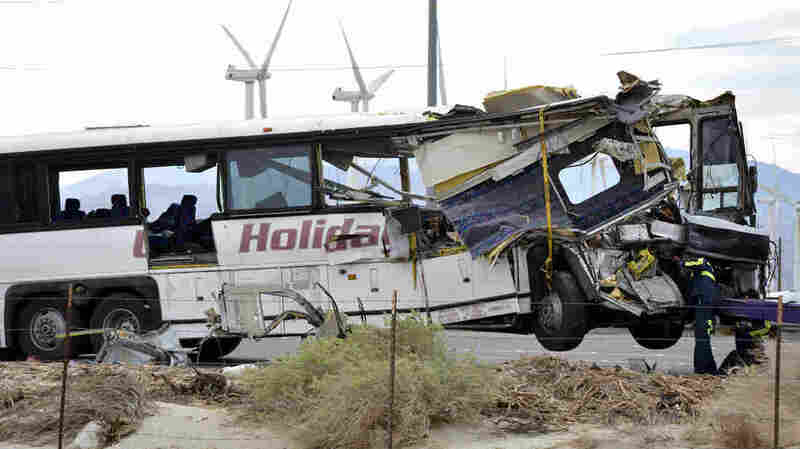 He made the comments at a recent NTSB hearing on a horrific crash involving a tour bus and a semitrailer outside Palm Springs, Calif., in October 2016. 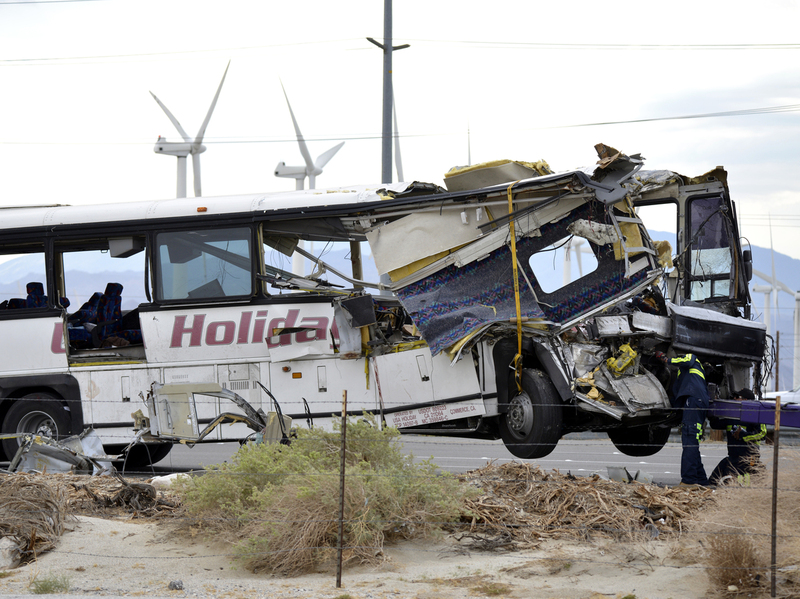 Workers prepare to haul away a tour bus that crashed into a semitrailer in October 2016 on Interstate 10 near Palm Springs, Calif. Officials believe the accident, which killed 13 people, involved the drivers of both vehicles falling asleep behind the wheel. In the pre-dawn darkness, police briefly stopped traffic for crews doing some utility work. When the highway reopened several minutes later and traffic started moving again, the semi remained still. Investigators say the truck driver fell asleep at the wheel. Two minutes later, a tour bus with 43 people onboard heading back to Los Angeles from a nearby casino crashed into the truck, killing 13 people and injuring 31 others. It's a crash the NTSB's Sumwalt says should never have happened. "On that October morning, on I-10 outside of Palm Springs, the system failed and we had one of the most deadly highway crashes we've seen in recent times," he said. The truck driver allegedly had falsified his logbook to indicate he had slept more in recent days than he actually had. Investigators say the bus driver, who was killed in the crash, may not have seen the stopped truck in front of him because he, too, may have dozed off. They found that both drivers likely suffered from undiagnosed, obstructive sleep apnea, a disorder that often causes fatigue. Under the Obama administration, Federal Motor Carrier Safety Administration regulators were drafting a rule to mandate that drivers be screened and treated for sleep apnea, but in August the Trump administration abruptly reversed course. "It is unacceptable that they have pulled this rule back," Sumwalt says, referring to the FMCSA. "And here's a case where people just riding on a bus, just paying money to go to a casino and back — they died because of obstructive sleep apnea in two drivers in two separate vehicles." The sleep apnea rule is not the only safety regulation halted in recent months. The FMCSA also killed a revamp of the motor carrier safety rating system and halted development of a rule requiring speed-limiting devices on trucks. Efforts to require underride guards on trailers — which would stop a car in a collision before the passenger compartment could wedge under the trailer — and automatic emergency braking on trucks are also now on hold. "I find the current climate troubling," says John Lannen, executive director of the Truck Safety Coalition, who says the Trump administration is undermining safety at a time when serious truck-related crashes, injuries and fatalities are all on the rise. "All the numbers are trending the wrong way," Lannen says. "We're over 4,000 deaths a year now in truck crashes. It's been going up steadily and we need to do something now." Whether more safety provisions could be cut once a new FMCSA administrator takes office isn't yet clear. President Trump's nominee, Ray Martinez, is expected to be confirmed by the Senate in coming weeks. But with the president vowing to repeal two regulations for every new one that's approved, even more rules designed to improve highway safety could wind up on the chopping block.